Carmela Castellano-Garcia made her way around the boardroom table in the conference room of San Jose City College. At just eleven years old, she was decades away from having her own seat at the table, let alone a full-time job. Instead, her role on this day was to collate and staple roughly fifty documents. Following the guidance of her mother, who was the executive secretary for the college at the time, Castellano-Garcia had to ensure the stack was in the right order and stapled properly, or she would have to start over. “I remember being really frustrated by the tedium of that but also really learning about the importance of things having to be right,” Castellano-Garcia recalls. It was that day as well that would lay the foundation for some of Castellano-Garcia’s most formative years. With the laps around the boardroom complete and the massive document in hand, it was ready to be handed over for review to Leo Chavez, the faculty senate president and a leader her mother greatly admired. Chavez would go on to become the chancellor of the Foothill-De Anza Community College District, the president of San Jose City College, and later president of the Sierra Community College District. It was then that Castellano-Garcia knew she was “going to be like Leo” when she grew up. Today, Castellano-Garcia is the president and CEO of the California Primary Care Association (CPCA), which represents more than 1,300 nonprofit community health centers and regional clinic associations that provide care for those who may not have access to healthcare. She’s also been in plenty of boardrooms since those days helping her mom, Carmen, at San Jose City College years ago. But it was the intangible qualities such as leadership, determination, and a tireless work ethic that stayed with her at an early age with help from her parents. It’s that same inspiration she invokes in others, particularly for women and people of color, who may not see the C-suite as a destination in their future. Having served for twenty-five years in the nonprofit sector and in various leadership roles, Castellano-Garcia says there are few women today in these same types of positions, and far fewer women of color. As a result, she stresses how important it is for women in leadership to invest time and effort in helping other women advance their careers. Inspiring women at an early age is essential for Castellano-Garcia to help accomplish this, and part of that is sharing her personal stories. As the only Mexican-American woman in her graduating class at Yale Law School, Castellano-Garcia says even if the odds seem stacked against you, simply use that as motivation. Castellano-Garcia faced those same obstacles when she was pursuing her education. She recalls vividly her high school counselor telling her that she belonged at San Jose State University, even though she dreamed of going to UC Berkeley. She did go to San Jose State, but ignored her counselor’s advice and ultimately transferred to and graduated from UC Berkeley before being accepted into Yale Law School. At CPCA, Castellano-Garcia furthered that message of pursuing one’s dreams when she introduced an internship program to cultivate future leaders. The program offers real-world experience for students interested in careers in public health or healthcare delivery. About twenty-five people have experienced the benefits of the internship program to date. Much has changed for Castellano-Garcia since her days helping to staple papers at San Jose City College. But what hasn’t changed are those lessons instilled in her at a young age by her parents: to push harder, go further, be bolder, and do better. These qualities have only grown stronger since she was that eleven-year-old girl circling the boardroom table, dreaming of being in the C-suite herself one day. “The entire time I was growing up and seeing my mother in action professionally during my youth was critical for me in terms of understanding the importance of professionalism, commitment, and high standards, because my mom is the epitome of that,” Castellano-Garcia says. Carmela Castellano-Garcia credits much of her success to her parents, and she says it was her mother, Carmen, who also instilled in her a tireless work ethic and leadership mentality. 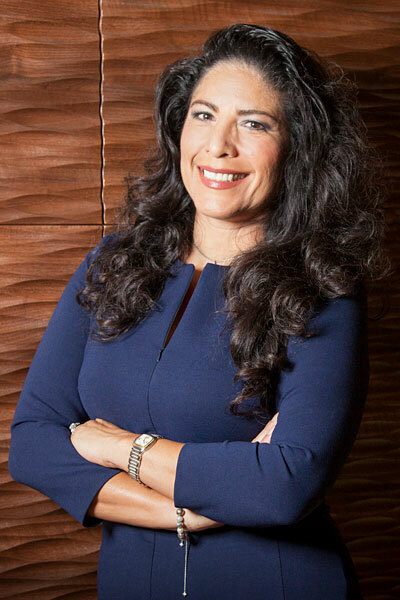 Years later, Castellano-Garcia worked again with her mom when they served together on the board of the Chicana/Latina Foundation, a nonprofit organization that promotes professional and leadership development of Latinas. The organization not only provides scholarships, but it also encourages young women to pursue leadership roles through its Leadership Institute. Castellano-Garcia continues to follow the lead of her mother, Carmen. Carmen and her husband, Alcario, started the Castellano Family Foundation (CFF) after winning the California State Lottery in 2001. The CFF was created as a way to give back to the community and to support organizations in Santa Clara County that were involved in Latino arts and culture, as well as education. Carmen was the primary trustee, serving as president of the foundation and running the day-to-day operations until Castellano-Garcia took over as the president of CFF in 2015. In this role, Castellano-Garcia works to carry on the legacy and example that her parents have set for their family and the community. It’s that example that inspires Castellano-Garcia to continue the tireless work that her parents set out to do fifteen years ago.